Eighty-four-year-old Flo Filion Meiler found a new challenge 19 years ago at an age when many people start to slow down. FLO FILION MEILER: I started doing pole vault at 65. Pole vault - she had already been a competitive runner since age 60. This was on the heels of a lifetime of water skiing and tennis. MEILER: I was never a couch potato - no way (laughter). 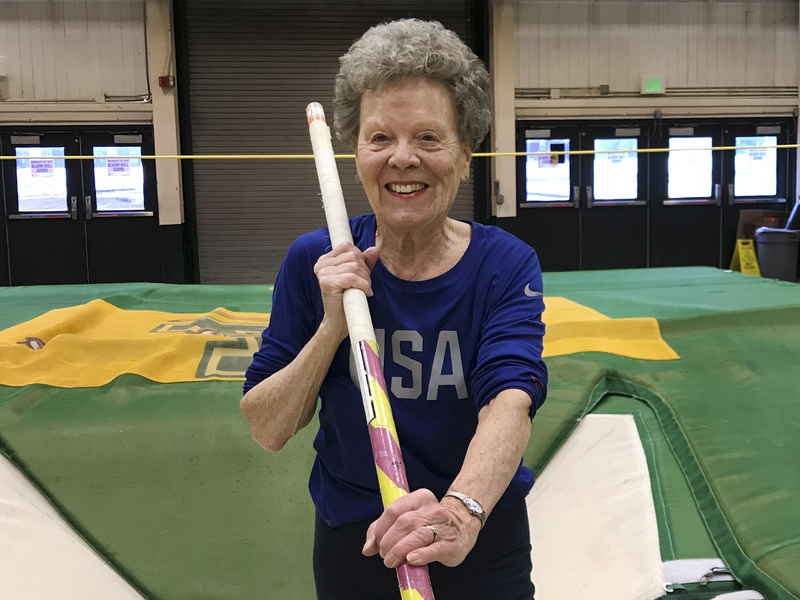 CHANG: So it was no surprise when a little more than a week ago, the octogenarian Vermonter set off to Poland for the World Masters Athletics Indoor Championship. MEILER: On Sunday, I did the high jump, and I got the gold in that. On Tuesday, I did the long jump, and I got a silver in that. And on Wednesday, I did the 60 meters, and I ended up fourth out of 11. And then on Thursday, I did the triple jump, which I got the silver. On Friday, I did the pentathlon and got the gold. On Saturday, I did the pole vault, and I got the gold. And then I did the 60 meter hurdles. I got the gold again. And then the 4x200 relay - got the gold. And the four of us ladies in our 80s set a new world record. SHAPIRO: Athletes aged 35 and older competed. There is no upper age limit. MEILER: There was one lady from India who was 103. SHAPIRO: She was a runner. MEILER: But she didn't run very fast, but she did it (laughter). CHANG: Flo Meiler was the oldest pole vaulter at the event. SHAPIRO: Meiler credits decades of herbal nutritional products for keeping her diet up to snuff. CHANG: And then there's her exercise routine. MEILER: On Monday, Wednesday and Friday, I will do track events, and on Tuesdays and Thursdays, I will do machine weights. And then I will play - doubles tennis I would be playing, but that's just social tennis. SHAPIRO: There is a price to be paid for growing old. Meiler says she now has to stretch twice as long before and after events than she did in her younger years. But she has no intention of retreating from competition. MEILER: You know, if the good Lord gives me my health, I'm going to keep going forever. CHANG: Flo Meiler - she'll turn 85 this June, just in time for another competition in New Mexico. Transcript provided by NPR, Copyright NPR.